Here John and Crew discuss fuel filters and the different types you can choose from… Then it’s all about teak care and how to varnish and oil it properly. In this half hour, John shows how to change out a rub rail after it has been damaged. Then he installs an hydraulic Jack Plate which helps a boater fish along treacherous bottoms. John teaches in this episode the art of color matching gel coat for those near impossible repairs. Then we learn the technique of rolling and tipping a new paint job. DESCRIPTION: For those of you who find it is time to change out the lower gear case oil… then its time to watch this episode. Also, fi you are finding things a little soggy below your hatches and windows, John teaches you how to Re-Bed those parts and keep them from leaking. DESCRIPTION: This Half Hour deals with a dry rotted transom and how to fix it using various types of fiberglass, resins, and epoxy. Then it’s inside the boat where John switches out some lighting. DESCRIPTION: More fiberglass repair in this episode as John and Crew Remove and replace a forward bulkhead with a delamination issue. Then it is all about our trailer light’s and how to fix problems with turning signal and brakes. DESCRIPTION: In this episode of Ship Shape TV, John compares the various products that make bright work easier on your boat. Then it’s all about the trailers as he re-carpets trailer bunks, installs guide poles, and introduces us to a posi-latch. DESCRIPTION: On the Stamos, John has been getting some leaking into his fuel system from rain water drainage. He decides to change out his gas cap to solve the issue and teaches us about some must use fuel equipment. We then switch gears and learn how to make our casting platforms more sturdy. DESCRIPTION: Several useful things… First we learn how to properly clean our bilge and help keep the environment safe. Then we dive into the Auto Tab system which is a very useful automatic way to control planning and listing issues.. then John shows us how mooring Whips can help keep our boats safe. DESCRIPTION: John and his crew enclose a transom on this episode and show us all the materials needed to do the job. Also. John investigates marine canvas on another boat as well as demonstrates how we can remove those nasty rust stains. DESCRIPTION: On this episode, John completes the closing in of a transom with fairing and gel coat. Then there is a useful section on non-skid paint. DESCRIPTION: After completing the closing in of a transom, John now measures out for an engine bracket that he will now use to hold the outboard for the boat. not only that, but we also are taken on an interesting factory tour of Armstrong Nautical Products and find out just how these engine brackets are made. DESCRIPTION: Time to get a head on your boat… literally! On this amazing episode of Ship Shape TV, John installs a full sanitation system. He teaches us how to properly plumb the system in and shows us what to use to break down the waste and make it safe for disposal. On the Bertram Moppy… John installs an aluminum windshield. DESCRIPTION: This half hour John shows us how to install and use a set of T-Top Mounted outriggers, then takes to the factory where they were actually built! DESCRIPTION: In this packed episode of Ship Shape TV, John cuts through the transom of a boat he is repowering for an inboard/outboard motor in order to install a transom shield kit. Then how would you like to have two operating stations on your vessel? Well at the end of this episode, John shows you how to install dual hydraulic steering systems so you can have that flexibility on your craft. 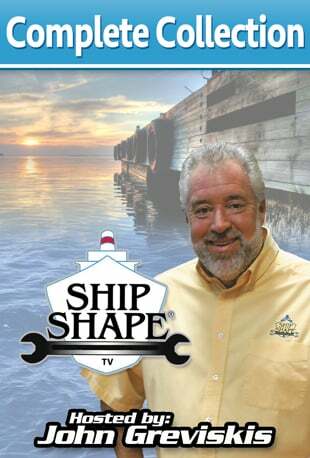 DESCRIPTION: Sounds like we are installing a new stereo system and speakers on this packed episode of Ship Shape TV. Also… want to extend your engine’s life? John teaches us how to recondition the engine’s plugs, wires, and belts. Then it’s back on the Bertram Moppy where John and crew finish up the repower of the Volva-Penta Stern drive. DESCRIPTION: John takes a journey with the kids today where he teaches them how to fish for Mahi Mahi with outriggers. Then it’s off to a manufacturer who only builds sailboats for children. After the factory tour, John takes his son to a professional sailboat instructor. DESCRIPTION: Ever get dings and gashes on your engine cowlings? Well in this episode of Ship Shape TV, John teaches us how to touch-up and re-decal those engines to make them look new again! Then its all about the boot stripe and how to replace a jagged one. DESCRIPTION: On the Oregon Coast in this episode as John installs a fishfinder on a Stabi boat… Then he gets involved in the release of a killer whale and helps out one of the release boats by installing a new dive ladder. DESCRIPTION: Having Trouble with your bilge pump? Well in this informative show, John deals with how to troubleshoot your bilge pump problems before you replace anything. Also installing a VHF radio is on the agenda as John works on his Contender. DESCRIPTION: Let John guide you in this episode on how to adjust your bearings on your on-board compass. Then on the Bertram Moppy John installs some new gauges to coincide with his new Volva Penta diesel engine. then back on the Stamos John shows you an operational technique involving your throttle and a piling! DESCRIPTION: Inside the 1978 Stamos project boat, John wants to give certain things an update. one of the things is a dated bulkhead door that enclosed the head. Learn what wood to use, as well as core materials and the proper hardware. DESCRIPTION: On the 1978 Stamos project boat, the air-conditioning unit wouldn’t cool and was causing some heavy condensation issues. Well leave it to John Greviskis to take charge and show us how to replace our ineffective marine A/C units with affordable counterparts. It’s a pretty COOL episode! DESCRIPTION: It’s all about bottom Painting your boat in this half hour of Ship Shape TV. Learn how to prep and repair your hull bottom for paint, the variety of different paints to use for this operation, and how to treat your metal parts below the waterline. Also John teaches us about shapeable epoxy and how it can be used for blister repair… Bottom’s Up! DESCRIPTION: The 1966 Bertram Moppy is now ready to install its steering and controls. In this episode, we learn all there is to know about the various options boaters have when it comes to steering and controls, as well as how to install them. DESCRIPTION: Important stuff in this half hour of Ship Shape TV. This episode deals with the Transom sealing on the 1966 Bertram Moppy. It used to be frail and flimsy and now John has beefed it up and is ready to add some insulation to keep the engine from being so noisy. Then it’s all about deck hardware and what to do if your replacement hardware doesn’t match the old hardware’s current holes.